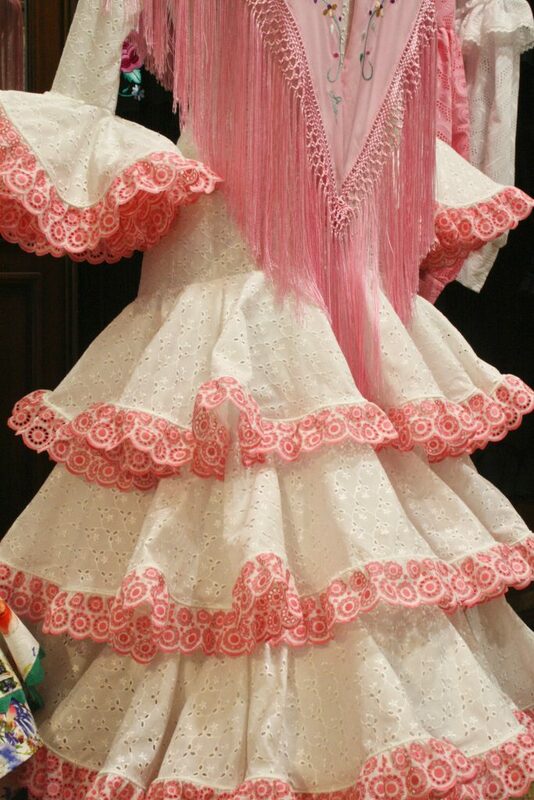 In April, when Feria is approaching, Sevillanas prepare their ruffled dresses, fringed shawls, combs and flowers for the hair. They visit shops and learn about the latest trends, as last year’s vogue is no longer fashionable. Indeed, flamenco dress (traje de gitana) evolves overtime. Some distinctive signs, a legacy of its popular origins, remain nonotheless unalterable: flounces, dots … Yet with these elements, well-established creators in Spain’s southern region produce every year dresses that oscillate between tradition and modernity, between haute couture and prêt-à-porter. Waist goes down or up, sleeves lengthen or shorten, fabrics vary, colors too … The traje would thus be the only regional dress subject to the diktats of its own fashion. SIMOF, the flamenco fashion week, is a showcase for all trends, during the défilés held in February every year in Seville. 1964. 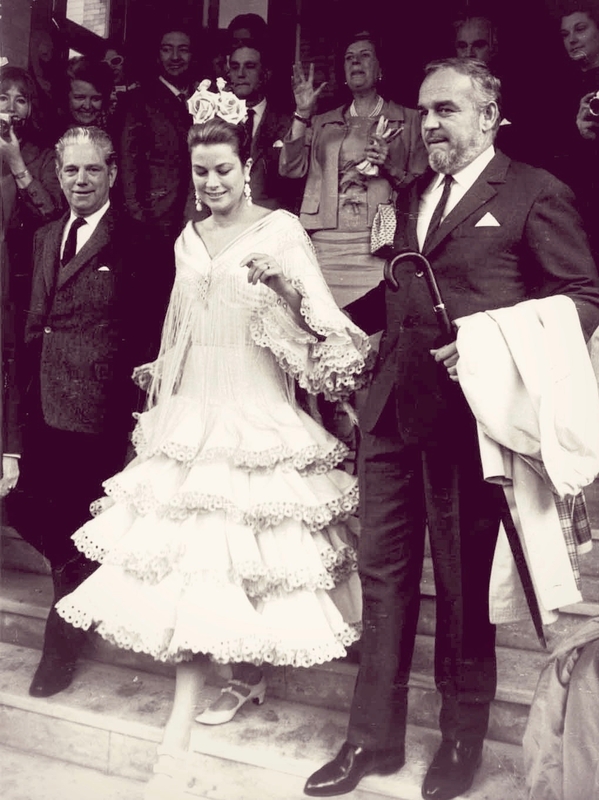 Princess Grace of Monaco visits the Feria de Sevilla and wishes to be dressed by Lina, a brand which, in a few years, has become famous for its savoir-faire of flamenco dresses. After a whole night spent to complete this unexpected order, Marcelina Fernández, dancer and founder with her husband (toreador and draftsman) of the aforementioned flamenco tailor shop, goes in the morning with the costume to hotel Alfonso XIII. In her suite, Lina remembers Grace Kelly as a “tall, light-skinned woman with small freckles.” During the fitting, everyone realizes with astonishment that no adjustment is necessary: the fabric adapts perfectly to the body. The image of the Hollywood star in a flamenco dress will tour the world and make Lina THE flamenco couture house par excellence. Since then, the brand has always been committed to making dresses in a completely artisanal way. Great care is taken in the cutting and finishing, resulting in unique pieces. Today, Mila and Rocío, Marcelina’s daughters, run the maison and take care of preserving its heritage. The shop next to Plaza del Salvador, which have been visited by John Galliano and Jean Paul Gaultier, is a mix of boutique, workshop and meeting place. The customers come to be advised to find the dress which will make them Feria’s most, in an atmosphere which, in spite of the brand’s notoriety, remains welcoming and relaxed. Lina is a big family. As its founder always wanted. A place open to all that is part of Seville’s heritage. An address worth visiting to understand this essential part of Andalusian folklore. Always under the sublime look of Grace Kelly.